Make your way on the nightmare on 23rd Street and get ready for a night out like you’ve never experienced. 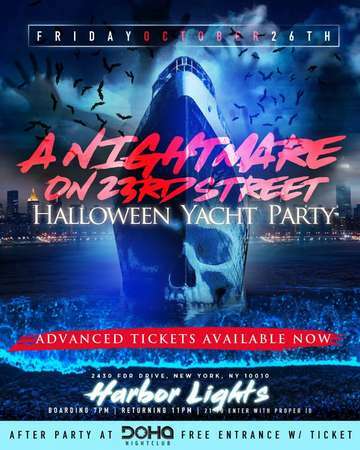 This NYC Halloween cruise is going to sail you through the city as you take in the sights from the Harbor Lights Yacht. Enjoy the views from the window-lined interior or make your way to the outside observation Upper deck. Dresscode: Halloween Costume Recommended but not mandatory. The DJ's aboard the boat will play a variety of music, at their discretion, with the goal of making a fun cruise for the entire crowd. Everyone must be 21 & over must present agovernment issued ID that will be checked by security prior to boarding the boat. Bottle Service? Choose a package and email us Partiesmanianyc@gmail.com or message us 347.801.4381 for information and reservations. Visit us at: www.partiesmania.com for more information about RSVP or Questions.